The Canoe to Canon project is a Heritage Lottery funded project (HLF) run by the Friends of the Maritime Archaeology Trust (MAT). It focuses on the significance of maritime archaeology and history tracing Britain’s development as an island and trading nation and encompasses possible trade in the Mesolithic (c8000 years ago) through to modern defence of the nation's trade routes. Surrounded by rivers during Prehistory, settlers used watercraft to reach Britain. As sea levels rose, developing trade routes required larger, sturdier craft. MAT has discovered a possible logboat at Bouldnor Cliff, a site now submerged off the Isle of Wight. The discovery of domesticated wheat (einkorn) at this Mesolithic site, 2,000 years ahead of elsewhere in Britain, demonstrates that trade with European farmers may have taken place via river/sea during this period. Over time, trade with other lands necessitated advanced watercraft to carry cargos on lengthier routes. Competition between nation states developed, leading to the use of weapons to keep trade routes open protecting goods from marauding vessels. By the 15th century cannon became commonplace on ships and by the 17th Century the Royal Navy were being called upon to protect trade routes. This project uses the maritime story to engage local people with their heritage, from the earliest trade through to the development of trade routes and the inevitable development of weapons for protection of cargo. Located on the north-west coast of the Isle of Wight, Bouldnor Cliff is Britain's oldest submerged human occupation site and has been dated to 8,100 BP (Before Present). It is unique in terms of its type and also in the range of organic and environmental evidence that paint a picture of life in the early Mesolithic period that is as wonderful as it is rare. The discovery of the remains of a possible ‘log boat’ at Bouldnor Cliff, demonstrates that the occupants of the site may have been using boats to travel along the rivers and lakes surrounding the area possibly to catch fish to eat. The Mesolithic people were hunter gathers, they were self-sufficient not depending on the exchange of food or items such as tools (of which there have been hundreds discovered at the Bouldnor Cliff site). The sophistication of some of the woodworking at Bouldnor demonstrates a technique not seen in the UK until the Neolithic (new Stone Age) over 2,000 years later. Also discovered at this site through the extraction of sedimentary ancient DNA was the existence of ancient wheat (einkorn) which indicates that farmed wheat that emanated from the Middle East was here 2,000 years before it has been found elsewhere in the UK. As this seems to be a discrete sample it does not seem that it was cultivated here, but there is the possibility that it may have been brought from Western France where the cultivation of wheat has been recorded around 7,400 years ago. As sea levels were lower at this time it is possible that goods and influences reached the Isle of Wight from France along coastlines via estuaries with the aid of watercraft. This video shows experimental work in splitting logs tangentially as exhibited by the log excavated at Boulnor Cliff. The participants of this project experimented using prehistoric tools to fashion the wood at an Event held at Exbury gardens. Butser Ancient Farm carries out experimental archaeology and contains archaeological reconstructions of ancient buildings from the Stone Age, Iron Age, Roman Britain and the Anglo-Saxon period. They also keep rare breeds of animals including pigs, goats and sheep and they grow crops from prehistory. One crop is that of einkorn, this is a type of ancient wheat the DNA of which was found in the sedimentary DNA at Bouldnor Cliff the Mesolithic submerged site off the Isle of Wight. The sample in which it was found is dated 2,000 years before it has been found on the land in Britain suggesting that the occupants could have been trading with people from France. At Butser they have also been carrying out experimental archaeology on the building of log boats, and a number of boats can be seen at the farm. The Prometheus Project is a project being carried out by Ryan Watts who worked at Butser, he is looking at the building techniques of prehistoric log boats or dugout canoes. He began by building a log boat from a half oak trunk around 3m in length, using fire to burn the inside of the boat then using replica bronze tools to remove the charred wood. You can hear a radio interview with images of the process of building the log boat and a video of launching the boat can viewed by clicking on the Butser Hill location on the map. Further experimental archaeology took place with the building of Mesolithic boats using ancient tools and inspired by the finds at Bouldnor Cliff. For those who would like to know more, a paper entilted Mesolithic woodworking, experimental archaeology & underwater heritage in Hampshire and the Isle of Wight (UK) by Sara Rich, Ryan Watts and Garry Momber gives a fascinating insight. It is quite possible trade was taking place using boats and waterways in the Mesolithic as demonstrated at Bouldnor Cliff. There is much evidence for maritime trade in the Iron Age, the remains of two jetties and an Iron Age log boat dating to 295BC have been found at Poole Harbour along with goods such as Amphora, pottery, iron items and shale jewelry. Roman jetties and wharves in the Port of London indicate it was an important trading port in the 2nd and 3rd centuries. Superior shipbuilding and navigational skills were brought by the Vikings in the 9th century and around the 12th century sturdy vessels appear in the form of the trading cog. Development of the trading cog led to the formidable warship of later centuries with 15th century vessels being built with towering fore and stern castles to give advantage to the archers and gunners during warfare. One example is Henry V’s Grace Dieu launched in 1418 which was one of the largest ships of the time being 66m long (comparable to the size of HMS Victory). It was built for use in battle with France but by the time the ship was completed England had control of the channel and was at peace with France. Although it was customary in the 15th century for larger ships to have a dual purpose, as in they could be hired out as merchant ships in times of peace, the Grace Dieu only ever made one voyage. By 1420 the ship was moored in the River Hamble, possibly as an impressive marvel with which to impress foreign dignitaries. This is attested to in the diary of a captain from a Florentine galley fleet who wrote in his diary after dining aboard that ‘he had never seen so large and splendid a construction’. Grace Dieu was laid up in the River Hamble at Bursledon where the remains have proved a unique example to maritime archaeologists and historians of the building techniques of the day. The ship is protected under the Protection of Wrecks Act 1973. Click on the location marker and see an animated video of the story of the Grace Dieu. The Mary Rose was launched in 1511 and was the flag ship of Henry VIII. The ship was designed with purpose-built gun ports to make the ship a fearsome floating fortress. In 1538 the threat of attack by the combined forces of France and Spain prompted an intense programme of coastal defence with blockhouses and castles being built at strategic points in the Solent and its river entrances. The alliance between France and Spain broke down and Henry joined forces with Charles V of Spain. The wool trade was one of the most important factors in the English economy during medieval times, and although in decline, it was still a lucrative trade in the 16th century, and Spain controlled the vital ports in the Netherlands through which it had to pass to reach continental markets. In 1545 the French began to assemble a fleet for the invasion of England, attacking at Portsmouth to cut off supply lines to Boulogne. The invasion was to be in July and Henry’s fleet of only 100 ships and 12,000 men waited for the French with a defensive strategy as they would be outnumbered by the French fleet of 225 ships and 30,000 soldiers. The buoys marking the channel entrances between the shallow banks leading to Portsmouth Harbour had been removed and English ships were to rely on their local knowledge. On 19 July the French fleet attacked, but from contemporary accounts and archaeological evidence, the Mary Rose had suddenly heeled while going about causing water to pour over the open gunport sills, with an inevitable loss of stability because of the additional weight of the insurging water, the heel became a capsize. The Mary Rose sank quickly to the bottom with the loss of nearly 700 men. The battle itself was inconclusive and history records it as more of a skirmish at sea. Embedded in the soft sediments of the seabed the starboard side of the ship became entombed and protected. The raising of this section of the ship in 1982, and subsequent excavations, has acted as a time capsule into the ships design and construction, and its contents provide a fascinating insight into the lives of its occupants. Click on the location on the map to see a video of the ship being raised. Portsmouth has been at the center of the UK’s military shipbuilding industry for more than 800 years. It was first granted its royal charter in 1194 when King Richard I ordered the construction of a dockyard and the first construction of a dry dock was commissioned by King Henry VII in 1495. Work began building the Mary Rose here in 1509, and the remains of the ship and much of its contents are now on display in a purpose built museum in Portsmouth Historic Dockyard. Moving on from the design of the carrack (such as the Mary Rose), changes pioneered by the English under Elizabethan rule, led to the development of the galleon around the middle of the 16th century. The galleon was longer, lower and narrower which made it faster and more maneuverable, enabling it to sail closer to the wind. The guns were mounted lower in the hull through portholes, this enabling more powerful guns which would not capsize the ship when fired. War ships in the 17th century evolved from galleons into 100 gun ships of the line. One such ship was HMS Victory launched in 1765 and was Admiral Lord Nelson’s flag ship at the battle of Trafalgar. Smaller faster craft called frigates would complement these. HMS Victory was moved into a dry dock in Portsmouth dockyard in 1922 and can be visited there today. Piracy was becoming a major problem around the shipping routes of the world and by 1680 Naval ships were regularly convoying merchantmen on major shipping routes. 1660 until 1725 was known as the golden age of piracy although privateering (a privately owned armed vessel commissioned by a belligerent state to attack enemy ships, usually vessels of commerce) was still a regular occurrence. Admiral Lord Nelson even stated his belief that “all privateers are no better than pirates”. In 1856 the Treaty of Paris outlawed privateering by individual ships but state operated navies could still legally stop, search and capture commercial ships guilty of carrying contraband to the enemy. These ships were better known as ‘sea raiders’ and they were especially prevalent during the two world wars with Germany’s unrestricted submarine warfare campaign propelling commerce raiding against enemy trade to new heights. Click on the location of HMS Victory to see a video of a mock firing being carried out. Fort Nelson is part of the Royal Armories and holds an impressive collection of artillery. It was built as part of Lord Palmerton’s Forts which encircle Portsmouth under the 1859 Royal Commission when the perceived threat was one of invasion by the French. It is one of 6 defensive forts built on the summit of Portsdown Hill in the 1860’s overlooking Portsmouth Naval Base. There are tunnels that run below the fort connecting the magazines with gun emplacements which can be explored by visitors and there is a daily live gun firing demonstration. There are displays and demonstrations with video presentations. Amongst the artillery are some beautifully decorated guns and cannon, these were occasionally crafted to be presented as gifts maybe to a king or queen. One particularly ornate gun was cast by Alberghetti a very famous family of Italian gunfounders originating from Ferrara (this family also cast the bronze gun that was found near the Santa Lucia shipwreck and now resides at Sunken Secrets on the Isle of Wight). There are also several guns that have come from ships. One particular cannon is from the wreck of HMS Royal George, a 100 gun ship of the line which sank at Spithead in 1782. The ship had been anchored along with the rest of Admiral Howe’s fleet in preparation to sail to relieve Gibraltar. Most of the crew were on board (shore leave was cancelled for fear of desertion) plus workmen, families visiting, traders selling their wares and ladies from the point at Portsmouth. The ship was taking on supplies when it was heeled over to port by rolling the starboard guns to the midline as a small repair was needed on the hull. Further loading continued through the gun ports on the low port side which made the ship unstable, and despite reports that the carpenter had twice brought this to the attention of the officer of the watch, it was not acted upon until the ship had passed its center of gravity, at which point it rolled over, quickly filled with water, and sank, taking with it around 900 soles including around 300 women and 60 children. Many of the bodies were washed up on the shore at Ryde Isle of Wight and buried in a mass grave along the beach which was later reclaimed in the development of a Victorian esplanade. There is a plaque in memory of the disaster in the Royal George memorial garden on the esplanade at Ryde. The 18th century saw Britain rise to a dominant position among trading empires and was the first western nation to industrialise. England had established a network of colonies including Virginia in 1607 and Barbados in 1625, and merchants were sending out ships to trade with them. The triangular slave trade run by the Royal African Company had its headquarters in London as did the East India Company trading in Asian waters. This was not achieved without many years of warfare and the support of the Royal Navy. In the 19th century the industrial revolution was accompanied by a large increase in shipping movements, and wooden hulled sailing ships were giving way to steam-powered iron ships (although most still carried sails until the latter half of the century). Along with these changes came developments in armament such as shells that would explode on impact which is one of the reasons iron clad ships developed. Apart from raw materials and manufactured goods, there was a need for coal. Britain built up the largest merchant fleet in the world at this time and around half of the ocean-going tonnage was under the Red Ensign. The dreadnought was the predominant battleship in the early 20th century and was known for its two revolutionary features, it’s ‘all big gun’ armament scheme and its steam turbine propulsion, although within 5 years this was overtaken by the super-dreadnought. The battle of Jutland was fought between dreadnoughts of Britain and Germany in the First World War. Amongst the shipping casualties of the First World War was that of the SS War Knight, a US steamer that was in collision with an oil tanker whilst zig-zaging in a convoy to avoid enemy submarine fire. The wreck lies in Freshwater Bay on the south side of the Isle of Wight a video of which can been seen by clicking on the location on the map and an account of the disaster can be read here. The Sea City Museum in the heart of Southampton tells the story of the maritime history of Southampton and its people with displays and an interactive experience for all ages. Southampton has been a port since Roman times with the Romans operating a busy port around 70AD until abandonment around 407AD. Saxon settlers followed bringing new trade and skills and trading with France, Greece and the Middle East exporting wool and importing wines and fine pottery. The port went into decline around the 10th century due to Viking raids and silting of the river Itchen, but a mediaeval town sprung up nearby known as Hamtun. The Norman conquests brought Norman immigrants with English and French quarters in the town, the most important import and export was still wine and wool respectively. During the Hundred Years War (series of conflicts between England and France) construction of naval ships took place including Henry V’s mighty HMS Grace Dieu in 1416 (see Grace Dieu on this map). Trade was flourishing with Genoa and Venice with traders bringing perfumes, spices and silk along with alum and woad (to dye wool). Exports consisted mainly of English wool and cloth. The Pilgrim Fathers departed from Southampton for North America on the Mayflower in 1620 and the 16th and 17th century was another period of decline for the port. Trade increased in the 19th century and new docks were built to cope with the overwhelming trade. Many passenger liners moved their service to Southampton including the White Star Line the owners of the fateful Titanic. The interwar years were a busy time with the port handling 46% of UK’s ocean going passenger traffic. Today the port is still an important and busy cruise ship and container port. The Sunken Secrets exhibition is housed at Fort Victoria on the Isle of Wight. Fort Victoria was built in the 1850’s and is a former military fort built to guard the Solent. It replaced an earlier fort on the site built in 1545-7 by Henry VIII. It is now part of Fort Victoria Country Park. At Sunken Secrets there is a display from the Bouldnor Cliff submerged landscape and also artefact displays, videos, interactive games and activities. Amongst the exhibits at Sunken Secrets is a small 16th century bronze cannon (known as a minion). This was found close to the wreck known as the ‘Yarmouth Roads wreck’ discovered during an archaeological survey off Yarmouth in 1984 as part of the Isle of Wight Maritime Heritage Project. The cannon was discovered the year before the wreck became apparent and bears the initially ZA which is presumed to be the work of the Italian bronze-founder Zuane Alberghetti. Excavations revealed many artifacts such as bronze, pewter and pottery that pointed to a Mediterranean origin, and research into the identity of the wreck narrowed it down to being that of the Santa Lucia which was carrying a cargo of wool to Flanders in 1567, when the ship 'by fortune p[er]ished and was lost in the seas thwart of yarmouthe in the Isle of wighte', the cargo is reported to have been salvaged. Excavation revealed that the wreck was a 30m long ship, quite large for the 16th century, and is now protected by the Protection of Wrecks Act 1973. The Maritime Archaeology Trust is the licensee for the Yarmouth Roads Protected Wreck site and regularly dives to monitor the site and any changes that occur. A report of the site can be read here. Click on the location of Sunken Secrets to see an animated video of archaeology and shipwrecks around the Isle of Wight. 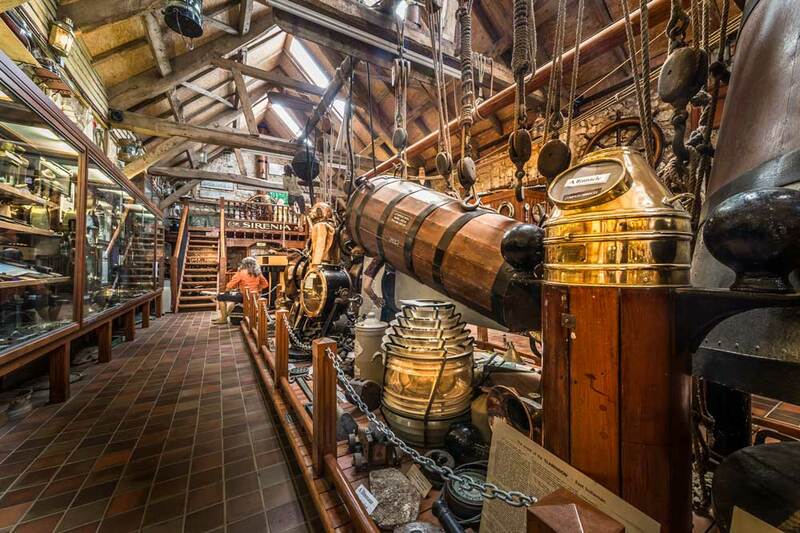 The Shipwreck Centre and Maritime Museum on the Isle of Wight holds a fascinating collecting of maritime artifacts. The museum is the creation of Martin Woodward, a professional diver since the 60's, who has dived hundreds of shipwrecks around the Isle of Wight and other locations worldwide and has had his collection on display since 1978 when he first presented it to the public. On display at the centre are 'Pieces of Eight' and Spanish gold and silver recovered from the underwater world along with many sad and tragic stories of shipwrecks and loss of life, with artifacts from some of the wrecks. There is also a display of antique diving equipment, ships models and other intriguing relics from the past. A section in the museum is dedicated to the Lifeboat and displays the original rescue service boards from the Bembridge Lifeboat Station and other associated local lifeboat archives. In 2017 the Maritime Archaeology Trust took over the running of the centre and Martin continues to actively research wrecks both locally and overseas. Click on the location of the Shipwreck Centre to see a video of some of the artefacts held at the museum.